Next week brings us to the end of the first term at UCT, and our final Tuesday evening concert at 7.30 pm in the Baxter Concert Hall features the UCT Big Band, directed by Darryl Andrews. Legendary South African jazz vocalists Leslie Kleinsmith, Madeegha Peterson and Nuraan Boltman will perform alongside jazz vocalists from the SACM Jazz Vocal Programme. On Thursday lunchtime, we will be treated to the Bowman Prizewinner’s recital by Ivan Preller, who will be joined by Estelle Roux. These two pianists swept up all the piano prizes offered at the SACM last year, and their programme is listed below. 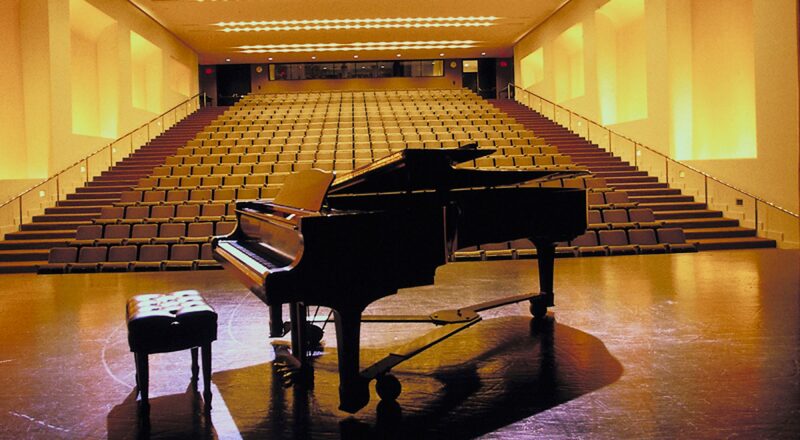 Admission is free, and the concert takes place in the Baxter Concert Hall. On Wednesday the SACM will host a round table talke about global music studies. This will take place in the Chisholm Recital Room at the SA College of Music, and all are welcome. Last but not least, please support the Fine Music Radio Bursary Awards on Wednesday evening in the Baxter Concert Hall. Note the early start of 7 pm. Admission is free, and seating is on a first-come, first-served basis. If you wish to check that the lunchtime concerts are, indeed, happening as scheduled, feel free to phone Milton Meyer at our reception on the day and he will confirm. Here below is the updated list of concerts. Please throw out all your old lists, as it has changed quite a bit since we last sent it out. The Quodropolka ensemble from Poland, for instance, has cancelled due to lack of funds to travel to Cape Town. Thursday 11 April Baxter Bowman Prizewinner’s recital (Ivan Preller), with Estelle Roux. Programme: two late Beethoven Sonatas (Op.81a Les Adieux and Op.110) and Rachmaninoff works for piano duet. Thursday 9 May Chisholm Recital Room, SACM Cone of Composition: Students must compose a work for the following instruments: Student composers who wish to compete in this annual and popular contest are invited to enter a new, original work for the following instrumentation: Flute (with B stop), Clarinet in B-flat (or auxiliary Clarinet in A, Bass Clarinet), Viola and Piano.